This week’s State Visits continued on March 28 with Queen Maxima, Queen Mathilde and Crown Princess Mary. On the second and final day of the State Visit by the President of Argentina, Mauricio Macri, and his wife, Juliana Awada, to the Netherlands, Queen Maxima and Juliana visited Orange House in Amsterdam which offers advice, assistance and care for people who are dealing with domestic violence. They then visited the Centre for Youth and Family in The Hague, as well as Mauritshuis. Maxima’s gorgeous purple coat is by Claes Iversen, and her shoes are Gianvito Rossi plexi pumps. In the evening, the foursome attended a ballet performance at the Diligentia theatre. Max does not disappoint in the bling department. Over in Denmark, King Philippe and Queen Mathilde were welcomed by Queen Margrethe, Crown Prince Frederik and Crown Princess Mary, and Prince Joachim and Princess Marie. Mathilde’s blue coat is Natan, while Mary wore Claes Iversen. In the evening, the royals tiara-ed up for a State Banquet. Queen Margrethe wore a beaded teal gown with the Danish Pearl Drop Tiara, pearl earrings, necklace, and brooch. She wore the sash of the Order of Leopold (Belgium) – the highest Belgium order. Queen Mathilde opted for an orange gown from Armani Privé and the full version of the Nine Provinces Tiara. She’s wore the blue sash of the Order of the Elephant (Denmark). King Philippe also wore the Order of the Elephant (Denmark) – the highest Danish order. Crown Princess Mary wore the gold Jesper Høvring gown she wore to the New Years Banquet, and the Danish Ruby Tiara and accompanying earrings and necklace. Mary wore the sash of the Order of the Crown (Belgium), which is a lesser order to the one Crown Prince Frederik wore which was the Order of Leopold (Belgium). Princess Marie wore a gold lace gown with the Danish Diamond Floral Tiara, and the sash of the Order of Leopold II (Belgium), a lesser order to the Order of the Crown (Belgium) which Prince Joachim wore. In the evening on March 29, the Belgian couple hosted a reciprocal event for the Danes at The Black Diamond Library. 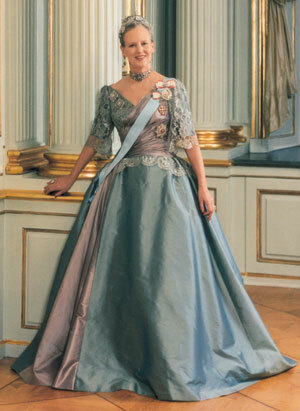 Queen Margrethe wore a repeated blue gown and that ugly fur wrap she loves so much. Queen Mathilde wore a stunning red gown from Natan, and Crown Princess Mary wore blue. Princess Marie wore a black beaded gown with a pretty scarf with a gold elephant design. Queen Maxima always looks like she’s having the best time. Also, she has an amazing jewelry collection, those two things may or may not be correlated. But they both make me smile. Thanks for the update. It’s always fun to look at the tiaras and pretty gowns. Maxima looks like she walks in a room and brings the sunshine along for the ride. Not because she wants to be the center of attention, but because she wants others to feel welcome and comfortable. G, what a great way to describe Maxima! Just lovely. The navy skirt and black blouse with the “bling,” was fabulous. Juliana is so lovely, too! Must say, the purple coat did not do it for me . Actually, I disliked it immensely. However, only Max can get away with that kind of look. She just is so conrfident. I loved Mathilde’s blue coat. It was elegant and the cut was amazing. I love all the photos and enjoy seeing what other Royals are doing . Thank you, KMR. The Dutch-Argentina wins hands-down. Queen Maxima brought out the best in family jewels, her clothes were on point and Juliana also slayed in the fashion department. I like how they wrapped an arm around each other’s waist. The Danish-Belgian visit…50 shades of boring and forgettable. I like the blue floral dress, but someone wasn’t paying attention when it was sewn or they were having a joke. I cannot unsee the unfortunate placement of two of the bright blue flowers in the first lady’s dress. What can I say? Queen Maxima looks beautiful again. The purple coat is really interesting, I never saw such a coat before. And also the black evening-dress with the blue brooch is gorgous. Juliana and Maxima seem to get along with each other quite well. In Denmark, I like the blue and green colours for the day and the orange and gold ones in the evening. But one thing is certain, Margrethe’s s fur coat is terrible and in my opinion tasteless. I know, it’s probably an old fur, not newly buyed, but it’s a statement for fur, you can not ignore. I like Margrethe, but that’s a big no. Mary looks beautiful in the blue dress and I like all the gold dresses.I hope Mary and Marie get along with each other, sometimes you have the feeling they are competitors which is sad, I hope, it’s just made up by the press. Queen Margrethe does not understand the concept of less is more. The fur warps is disgusting and doers hanging off the side of her bust is excessive. 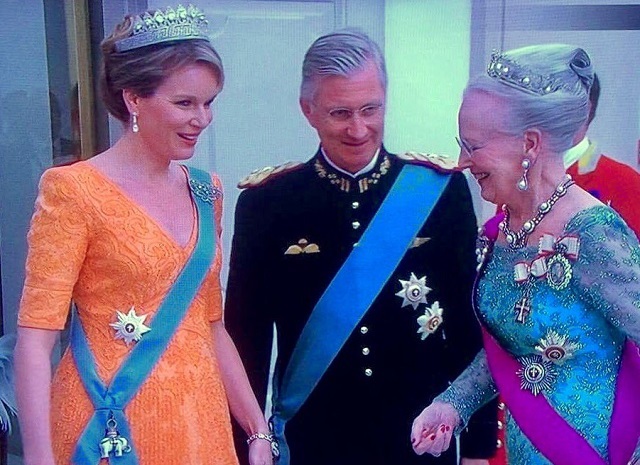 I find Margrethe’s evening style over-the-top but Old School I Am the Queen. I find that kind of adorable about her, even if I don’t always think she looks good. She has some beautiful gowns underneath all the bling, and she’s designed many of them herself. She paints, designs sets for ballet productions, design gowns, and has exhibits about her interest in archaeology. I think sometimes she designs her outfits like she’s designing the costumes for a Queen on stage, because it is a role she plays. She’s one of those royals I’d like to have lunch with. Queen Maxima seem beautiful inside out, always happy and the glow shines through. Lovely jewels! Both countries, all seem happy genuine and inviting. Both RFs work for country and the world. This is another post including the SRF, that bring smiles – thank you KMR. The woman at the museum in The Hague appears to be wearing the same Alexander Macqueen that Kate wore to Wimbelton last summer. I prefer this black version over Kate’s white one. I prefer the black version as well, but the white one suited Kate better, I think, and was a better choice for Wimbledon. I LOVE brooches however I doubt I can pull them off. Don’t worry, Miley. I suspect very few people could pull off that brooch! You know Miley, I’ve always thought that if you love something, a piece of jewelry, clothing or furniture, the love you have for it will make it work. Wearing brooches could become your signature look and I bet others will be looking at you envying your panache. That’s true! Most people are afraid to ridicule themselves, me too. I would love to wear hats like women used too, but I would embarass myself. You can wear really little decor today, it’s a pity. Queen Lauri said it! If you wear it and own it, it can definitely be your signature. I love brooches too. Every time I watch Mad Men and see Joan Holloway I want to start wearing brooches too. Everyone looks so relaxed and confident and the amount of bling was fabulous. Can you imagine Kate at one of these events…. after 6 years of being in the BRF she is still like a stick of wood and it is really too bad. She just has no polish and no aura of sophistication. Sigh, so true BostonBrahmin, so true. Imo, it’s the way she carries herself that conveys a child-like quality, as if she is being seated at the adults table for the first time and isn’t sure she belongs there. I often wonder why Kate is the way she is..does she just not give a rat’s *ss since she married the heir to the throne, produced the required 2 children and now feels entitled to the spoils of her position? Is she a cold fish who is totally self-absorbed, is she lazy and dumb, or does she suffer from acute anxiety when in public which makes her overcompensate with those maniacal smiles and hand gestures while her body language tells a different story…bad posture, crotch clutching and rounded shoulders. I could never see Kate wearing the gold gown that CP Mary wore because Kate does not seem to like statement jewelry which that gown requires. She only seems interested in statement hair. Or I could be totally wrong and maybe she does want to up the bling factor but her grandmother-in-law is not offering to let her borrow anything. Kate could take all her Kiki earrings and string them together and make a necklace. Does Maxima ever get criticized for her clothing budget or how much money she spends on clothing. Seems to be one of the top critiques of Catherine and CP Mary. Just curious because she seems popular with bloggers but what’s her polling like in The Netherlands. Hi Jessica, personally I tend to criticize Kate’s clothing budget because the amount that she spends compared to what she does and how little time she spends at an engagement just doesn’t add up. Whereas, again just my opinion, CP Mary and Maxima might spend more but also work more, spend more time and frankly act more serious about their roles than Kate does. Well yes, Queen Maxima and CP Mary have a much heavier load than Catherine has which is why I personally don’t get to worked up over their clothing cost (but I’m American and don’t support a monarchy; just an indulgent First Family). I also expect royalty to dress nice and not wear readily accessible clothing most of the time; just on their private time and low-key events. I also looked up Queen Maxima’s approval rating; most popular member of the Dutch RF with a 7.7/10 approval rating. The Dutch royals are some of the personally wealthy royals (shares of Shell oil), but they are also one of the most costly monarchies. They’ve been criticized for those costs definitely. Wax&Max receive a lot of criticism over vacation homes, and whether or not those homes are secured with taxpayer money. I think they had to sell the one in Africa, then bought one in Greece. Those were both criticized, but the ranch in Argentina seems to be accepted as a way for the kids to spend time with their grandfather. The Dutch royals were also criticized last year for selling a painting that was considered of historical importance. Question of whether it was personal or private property, which money paid to have it restored, whether they should have donated it to a museum. Their popularity helps with a lot, but I think all monarchies need to be watching their step. I’d expect Belgium’s monarchy to fall before any other European ones, mostly related to separatist politics. Or Spain. They’re hurting but I love Felipe and Leonor. This is not good. Again, a refusal to be accountable for how public money is spent. Dutch politicians seem to be similar to UK politicians: excessive forelock tugging and not holding ‘royals’ to account on behalf of the people. For me, personally, part of the issue I have with Kate is that she spends quite a bit of money, but rarely looks special. Her pieces are, admittedly expensive and well made, versions of clothing I have in my closet, it’s boring. Also, I often don’t particularly care for her taste in clothing or accessories. Max spends more money, but her clothing and jewel choices are usually fun and fantastical. At this point, I think Kate shops just out boredom not that she loves fashion or jewelry. All the pieces that look the same, the never ending array of Kiki’s. Oh, my gosh, I really don’t like Mary’s blue gown. The cut-outs and fabric shout, “cheap,” to me. Max is stunning. Just amazingly vibrant and a fashion maven. Whatever she wears, even the items that I don’t care for, well, she rocks her wardrobe! Juliana is quite beautiful, too. The two women really took a liking to each other and I think the visit was enjoyed by all. Maxima’s purple coat was a bit strange to me. But, again, she knows how to bring the wow factor to the world whatever she dons. Her smile is a killer, too! So happy to see all these lovely photos. It’s a refreshing change from the Kate looks, which I just am not “keen” about. I guess, Kate is going to stick to what she is comfy wearing. Some people probably love her look. I am not going to say much else. I just don’t share her taste. I’m sure she doesn’t like mine, either. I’m not crazy about the cutouts on the blue gown either, however, Mary has such poise and confidence (and amazing figure, too) that she makes the dress, instead of the other way around. Same thing with the gold dress. She always looks great. I think Mary’s gold dress by itself would be boring, and I would say so if Kate wore it. But with the ruby jewelry and the sash it looks nice, and I would say so if Kate wore it. I think it is very plain, and sometimes that can be good for displaying all the orders and bling. Orders and ribbons can get lost in the busy gowns. Some of Mary’s best looks to me are the simplest. This gold one (if she’d lengthen the sleeves), the pale pink silk one, the burgundy velvet. The blue one she has, that mimics the pink one, fails for me because the shiny satin and embroidery makes it look cheap. To each her own. I still found the dress very blah. I guess I am not as much a fan of Mary’s as I used to think I was. Constance, I will tell my mother. Thanks for your comment. I hope you are well. My mom said that one of her older cousins used to get the catalog from Frederick’s, but she and her other cousins were not able to find out if she bought anything from the store/catalog. Racy, yes?! Someone please bring the smelling salts as I’m going to swoon 🙂 I am in royalty heaven!!! Thank you so much KMR for the lovely post. Tiaras and bling, oh my!!! While I’m a bit disappointed with Mary’s gold dress it does make the perfect blank canvas for these stunning jewels and the blue dress she wore on the second night was just Wow! Definitely a dress I would like to see on Kate. I’m still on the fence with Mary’s gold dress. I cannot like those little sleeves. I hope she adapts this in the future to add either elbow-length or 3/4-length sleeves. I like both of Marie’s dresses, but the black one is better without that wrap. She first wore that dress a few months ago. I love that Max is just herself. She wears what she likes, and exudes confidence and kindness. I absolutely adore her smile lines and forehead wrinkles…it is as if she is A-OK with herself just as she is! Shocking concept! Just looking at her makes me feel inclined to accept myself more and embrace all the unique things about myself. I think that is a gift unique to Max – she has the ability to make people feel that way, just in her demeanor and the way she carries herself. She certainly is a joy. It’s important that we have those natural rolemodels! I don’t want to go to a retirement home as an old lady surrounded by the botox faces of my generation. Maxima is a natural beauty and I adore her even more for it. Queen Maxima is one confident, fun, and joyful woman. As others have pointed out, she exudes confidence and an air of total love of life. There is something so very engaging about her style. Juliana is also a beautiful and confident woman. The two women seemed to get along well and enjoy one another’s company. Each looked lovely and each has true style. Maxima’s coat was a tad unusual looking and on another woman I would not have enjoyed it so much . She just wears everything with true aplomb! The brooch and her ensemble were gorgeous and so was Juliana’s look. Such elegant women. I did not like Mary’s blue gown, either. The cut-out look is not very regal imo. How lovely it is to check in on other Royal women and see their gowns and jewels. Kate plays it so safe, but I assume that is just who she is. I keep wondering why, but I should just accept her and move on!!! I do think that in her most recent solo appearances, she has tried harder than usual and seems to be growing. She just doesn’t have the “it factor,” that would overwhelm us whenever she goes anywhere or does something of import. That is not to say that she does not have something going for her. It’s just hard to get really excited about her most of the time. At a distance I thought Maxima was wearing some sort of robot brooch!! Haha then I zoomed in. =) I love the color of the purple dress but not the starburst patterns on it. I think orange can be a hard color to pull of but Mathilda looks lovely in it. Not a fan of Mary’s gold dress. I just noticed that in the first group foto of the danish royals, they all hold their hands almost the same way as in the second group foto, especially King Philippe.It’s quite comical.Do they have their rehearsed pose or is this unintentionally? Queen Maxima has a beautiful smile it is like sunshine. Queen Margrethe’s wrap looks like a coyote I once saw when vacationing in New Hampshire! Queen Mathilde has been looking more fashionable of late, she seems to be more adventurous in her choices. Not a fan of CP Mary’s blue gown, it does not know what it wants to be when it grows up. Love the bling, the stylish and feminine day outfits and the gorgeous evening gowns. I love both of CP Mary’s gowns too! But yes it is fair to ask how much do royals like Maxima and Mary spend on clothes? Why are Joachim and Marie on the royal payroll too? They need to get proper jobs. I have a feeling that one of the European monarchies fall within the next few years, then it’ll be like a domino effect on the other European houses and their days will be numbered.